Over the last week, both my wife Tara Laskowski and I have had one piece of writing brought up time and again in conversation—and it’s not a work of fiction by either of us. Online, in emails, and in person, many people have commented—always positively and sometimes with great enthusiasm—about Tara’s article “Children Allowed?” in Publisher’s Weekly last week (published online here as “Why Parents Should Take Their Children to Literary Readings”). 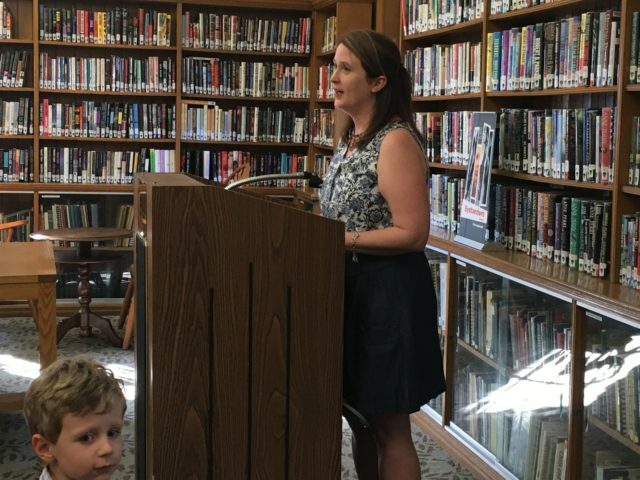 The subject came up several times in conjunction with Tara’s recent reading at the Osterhaut Free Library in her hometown of Wilkes-Barre, Pennsylvania. The librarian hosting the reading and I talked about it after she very nicely provided our son Dash with some popcorn and lemonade; a new friend in the publishing industry, also a Wilkes-Barre native and a new mom herself, congratulated Tara on the essay and asked if she was interested in writing more on parenting (possibilities, Tara? ); and then when I shared the picture here on Facebook, several comments echoed about Dash’s photobomb in the corner and about his string of literary appearances. I couldn’t help but have the article on my own mind throughout the event—with an equal mix of pride and self-consciousness—as Dash kept getting up from his chair for a sip of lemonade, and to examine the podium where his mom was reading, and to pass out bookmarks to late-comers, and…. In other news, I published a quick blog post on Friday at Criminal Minds in answer to the question “If you could host a dinner party where the guests didn’t actually have to be alive, which three writers would you invite?” As I respond in the title of my post, “Our Dining Room Table Actually Seats Six.” Check it out to discover an eccentric guest list, promising a dynamic (and maybe sometimes difficult) dinner party ahead.